Atlantic Puffins are pelagic for most of the year, spending their time alone in the cold open northern ocean a long way off shore. They dig a burrow or tunnel on an island to lay their one solitary egg. Puffins only come onto land to breed in colonies, usually with the same partner in the same burrow, every spring and summer. They bring fish back to the burrows to feed the little "puffling". The Atlantic Puffin are brightly colored only during breeding season and since breeding season is the only time they are visible it works out perfectly for photographers! This entry was posted on Monday, February 4th, 2019 at 2:22 am. 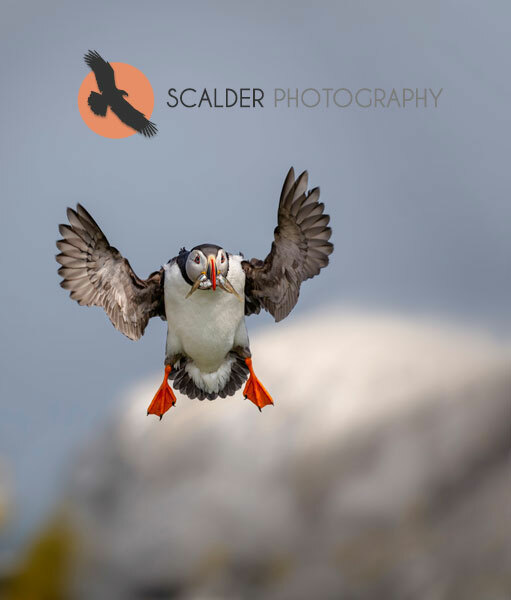 It is filed under Animals / Wildlife, New Images and tagged with Atlantic Puffin breeding behavior, Atlantic Puffin in flight, Puffin, scalderphotography. You can follow any responses to this entry through the RSS 2.0 feed.